This single ended funeral spray is made on an oasis base with a mixture of flowers in shades of pink. Soft foliages such as feathery light Aparagus fern and Eucalyptus are a perfect foil to Scented Oriental Lilies and Roses. Accessorised with white Phlox and green Hypericum berries it is completed with a few carefully shaped and curled Aspidistra leaves. 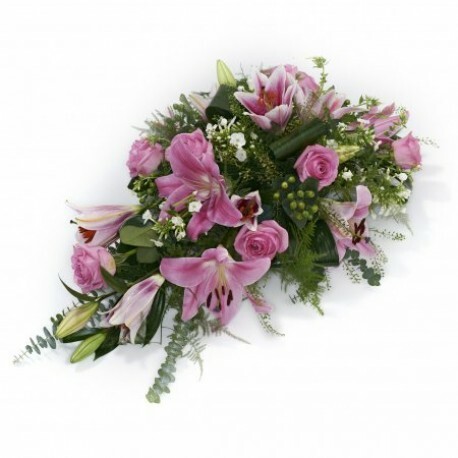 The whole effect is very soft and feminine, a very tasteful tribute for any special lady. If you wish we can add a ribbon dedicated to the recipient such as Auntie, Gran or Special Friend and of course we will write your message on a card that co-ordinates with the tribute. yo could of course choose to have the arrangement made up in othe colours such as creams and whites, yellows and golds or reds and oranges. Please bear in mind that whilst we do our utmost to create arrangements like those shown in the pictures, it is not always possible to make an exact copy.